Sold exclusively in the U.S.
Subaru fans, can I get a “Hallelujah” and an “Amen”? The time has finally come, and that time is for a homologated S-line Subaru Tecnica International (STI)-built performance car to come directly to America. Introduce yourself to the 2019 Subaru WRX STI S209, the 9th high-performance car from STI in the past 20 years. Until now, these cars have been exclusively available in Japan. With the S209, however, Subaru sees fit to send it to the U.S., where 200 examples will be available toward the end of the calendar year. Not only that, it will be exclusive to the land of the red, white, and blue. Smug satisfaction is sometimes worth the wait. This is the ultimate WRX STI. Inspired by the WRX STI Nurburgring Challenge racecar, the S209 gets a wide-body exterior treatment measuring 1.7 inches broader. The car’s track is wider, too, stretched 0.6 inches front and rear. To this, Subaru adds vented front and rear fenders. The front vents are to improve engine cooling, while the rear fenders reduce turbulence and aerodynamic drag. Front, side, and rear underspoilers are present and accounted for, and the roof panel and large rear wing are constructed of carbon fiber. Two color combinations are available: WR Blue Pearl with gray wheels or Crystal White Pearl with gold wheels. Either way, S209 badges adorn the car. Inside, the changes are not as dramatic. Recaro seats are standard with special silver inserts and “S209” on the head restraints. The flat-bottom steering wheel gets an STI badge, and both the steering wheel and the center console storage lid are wrapped in Ultrasuede with silver stitching. To make the car official, an S209 serial number badge is affixed to the center console. Underneath the wider bodywork, the WRX STI S209 gets a thorough performance tuning. 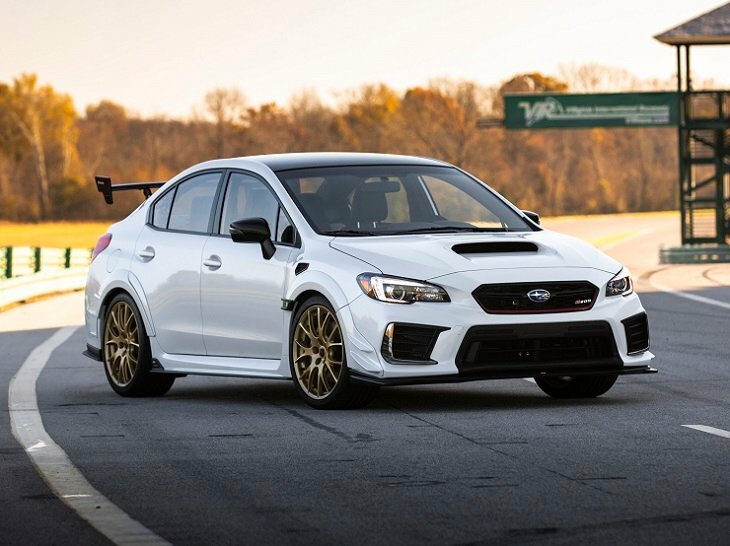 STI starts with the 2.5-liter 4-cylinder engine, to which it bolts an HKS turbocharger with a larger turbine and compressor and 18 psi of maximum boost pressure. The engine also gets lighter and stronger forged pistons and connecting rods, as well as improved air intake, fuel, and exhaust systems, the latter with larger polished tips to bellow about the car’s superiority. The result of these changes is an estimated 341 horsepower and a bump in midrange torque of approximately 10 percent. A close-ratio 6-speed manual gearbox channels the oomph to a full-time all-wheel-drive system with front and rear limited-slip differentials, a Driver Controlled Center Differential (DCCD), active torque vectoring, multi-mode vehicle dynamics control, and a revised SI-Drive system modes. Additionally, the WRX STI S209 gets front crossmember and rear subframe reinforcements, a flexible strut tower bar, and draw stiffeners. Specially tuned Bilstein shocks, stiffer springs, a thicker 20mm rear stabilizer bar, and revised bushings round out the suspension upgrades. These modifications, paired with exclusive 19-inch forged aluminum BBS wheels wearing 265/35 Dunlop SP Sport Maxx GT 600A summer tires, produce claimed maximum lateral grip exceeding 1.0 g.
Brembo brakes with cross-drilled steel rotors, high-friction pads for improved fade resistance, and 6-piston front and 2-piston rear calipers bring the fun to a stop.